Bound by tradition. Now they must follow the rules.SHORTLISTED FOR THE WOOLLAHRA DIGITAL LITERARY AWARDS 2017Companions are the kingdom’s most beautiful and educated women—possessions of Syrasan’s royal men. Aldara is sixteen years old when she is sold by her farming family to the obnoxious Prince Pandarus as a gift for his younger brother, Prince Tyron. Resistant at first, the new Companion soon realises she must embrace the role or face the consequences of her failure. Prince Tyron has just returned from war. All he wants is privacy to grieve the men who died at the border. At his brother’s insistence, Tyron attends a social hunt where his Companion is introduced for the first time. He senses something beneath the polished exterior presented to him. She is not like the others.While initial encounters between the troubled war hero and his reluctant Companion are awkward, their connection is immediate. But they are soon reminded by those closest to them that there is no place for love between a prince and his Companion.Set amid grief and war, The Royal Companion is a heart-warming love story about what it means to give yourself over to another.Warning: This book contains sexual violence, death and dark themes.Please note: This is a revised edition. It is part one of Tyron and Aldara's story. Their story continues in books two and three—available now.Interview with the AuthorQ – So, why did you write this book?A – I never intended to write a Romance novel, but when I was pregnant with my second son I experienced really vivid dreams that would remain with me for days after. The two main characters in this book remained with me for much longer. They were in love, and they were in pain. I had to tell their story. There is an intensity to their relationship that I think readers will love.Q – Is this book part of a series?A – Yes, it’s the first book in The Companion series. Aldara and Tyron's story continues in book two, The Common Girl, and book three, The Majestic Impostor. 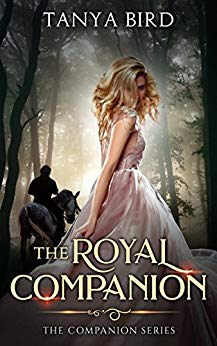 Book four, The King's Obsession, is also now available.Q – Why should readers give this book a try?A – The Royal Companion is a tender and fierce story about a forbidden love. Readers will lose themselves in this alternate-world, and the characters will remain with them long after they finish reading.Q – Who will this book appeal to?A – This novel does not fit neatly into one Romance sub-genre. Its medieval setting and characters will appeal to both historical and fantasy romance readers. Throw in some horses and action, and you have quite the Romance hybrid.Thanks for reading.